The Mayor has awarded over £28 million to outer London boroughs in order for them to transform the public spaces around Crossrail stations. The TfL funding will support local borough-led projects at seventeen stations in Greater London and will help cut crime, improve road safety and make areas more pleasant for millions of passengers. The improvements will be made by 2019, and will follow a huge range of other benefits that customers will experience when TfL takes over services between Liverpool Street and Shenfield from 31 May next year, ahead of Crossrail arriving. Customers on all of the new TfL-run rail services will benefit from improvements, including staff at every station at all times that trains are running, better accessibility provision, including a turn up and go service for anyone needing ramps onto trains, full integration with TfL fares and ticketing and a more reliable service. TfL-run Crossrail will carry over 200 million passengers a year, boosting London’s rail-based capacity by 10 per cent, easing crowding and providing faster journey times. It will help London keep pace with a rapidly growing population and will support new jobs and economic growth. Crossrail is the first transport project to deliver integrated designs with three elements in mind, including the station, above the station, and improved public spaces that surround them. These have been designed in close partnership between TfL, local authorities, Network Rail and Crossrail Limited. · A Public Space scheme at Hayes and Harlington in LB Hillingdon is proposed to be funded as part of a Local Implementation Plan Major Scheme that is already in development and design for Hayes Town Centre. · It is anticipated that over 200 million people will travel on Crossrail every year. · Crossrail will serve 40 stations, linking Reading and Heathrow in the west, to Shenfield and Abbey Wood in the east, with 21km of new twin-bore tunnels under central London. 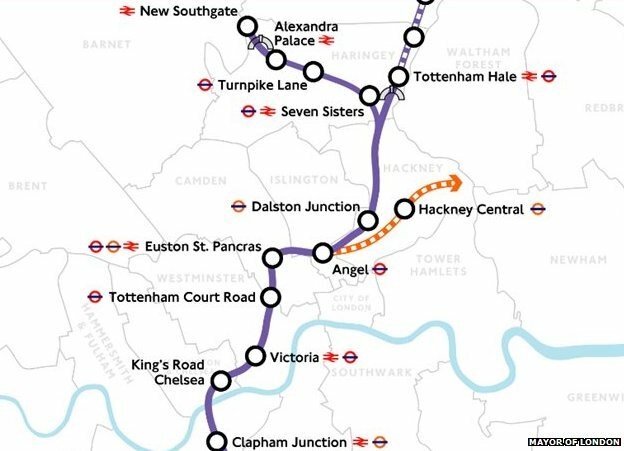 A preferred route for a proposed £20bn Crossrail 2 scheme, running north-south through London, has been identified by mayor Boris Johnson. A second Crossrail scheme is vital to support the capital's growth, the mayor claimed. If approved by the government, the line could be transporting up to 90,000 people into central London in the morning peak by 2030. Crossrail 2 would run from Cheshunt in Hertfordshire to Epsom in Surrey. It would pass through central London via places including Tottenham Court Road, Victoria, Chelsea and Clapham Junction. If proposals are approved, construction could begin in 2017. Setting out the case for the line in a speech at the City Age conference, the mayor said: "With London's population soon to surpass its previous 1939 peak of 8.6 million and with more people travelling by Tube and rail than ever before, we need additional rail capacity to support future growth. "For the capital to remain globally competitive, there needs to be continued investment in our transport network and that's why we have to get cracking on planning for Crossrail 2." The scheme would complement the £14.8bn east-west Crossrail scheme, currently being built and scheduled to be operational by 2018. Supporters say it will slash journey times across London, with a journey from Kingston, in south-west London, to Tottenham Court Road being completed in 29 minutes - 17 minutes faster than today. Those travelling between Dalston, in north-east London and Tottenham Court Road would have an eight-minute journey - 19 minutes faster than today. Mr Johnson said he was confident the private sector could, in the right circumstances, contribute to well over half the cost of Crossrail 2. Opportunities for consultation Labour Assembly Member Val Shawcross said the announcement of a preferred route was "a big step forward" but added: "What we need to see now is the fully worked-up funding package which will make this project a reality." Despite broad support for a new rail link in Chelsea, it is one area where there is concern over the positioning of a new station. Conservative MP for Chelsea and Fulham, Greg Hands, has said there was "a great deal of concern" from residents on Cremorne Estate, on the King's Road, that demolition of housing may be required if it is chosen for the location of the Chelsea West station. The current proposed location for the station would be further east near the fire station on the King's Road and received the majority of support in this summer's consultation. The consultation document says, over the course of 2015, there will be further work on the consideration and assessment of options and a number of opportunities for more detailed consultation.